Bald Faced Hornets Are Back. 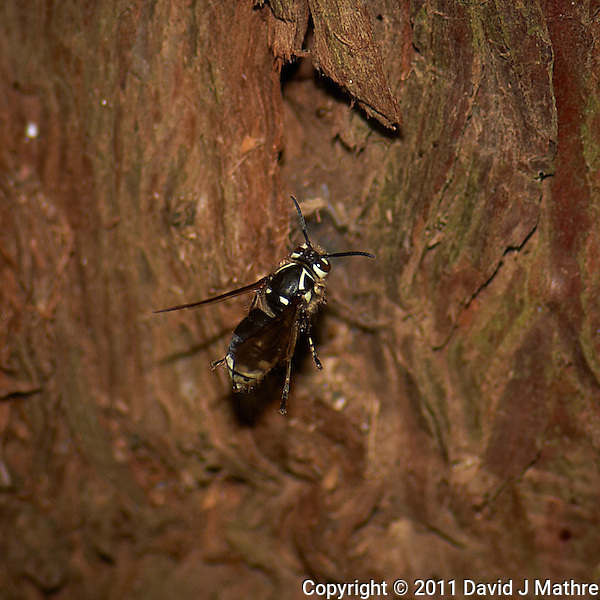 I thought I saw a Bald Faced Hornet yesterday, but by the time I got back out with a macro lens it was gone. 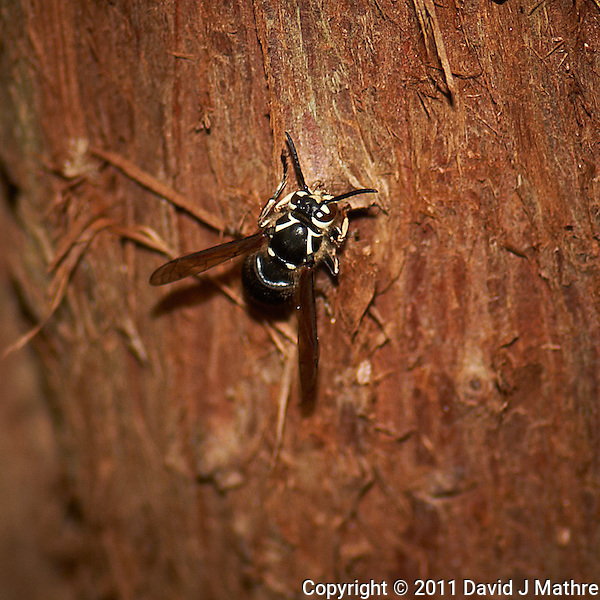 I went out again today and found one on a cedar tree trunk. It looked to be collecting wood fiber for its nest. I walked the yard looking for the hornet nest/hive, but have not found it yet. It was a year ago that I discovered a basket ball sized Bald Faced Hornet Nest/Hive. At that time I set up a telescope so I could take a movie of the nest from a safe distance. 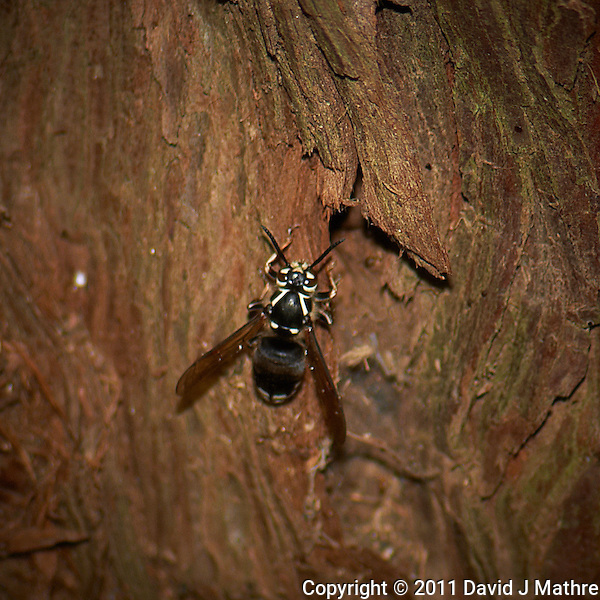 Bald Faced Hornet Harvesting Fiber from a Cedar Tree Trunk. Summer in New Jersey. Image taken with a Nikon D3 and 105 mm f/2.8 VR macro lens and TC-E III 20 teleconverter (ISO 200, 210 mm, f/6, 1/60 sec) and SB-900 flash. Raw image processed with Capture One Pro and Photoshop CS5. 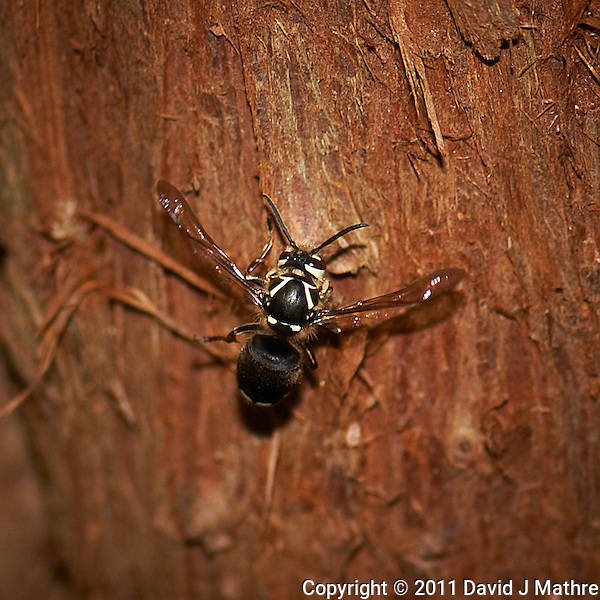 Hovering Bald Faced Hornet Harvesting Fiber from a Cedar Tree Trunk. Summer in New Jersey. Image taken with a Nikon D3 and 105 mm f/2.8 VR macro lens and TC-E III 20 teleconverter (ISO 200, 210 mm, f/6, 1/60 sec) and SB-900 flash. Raw image processed with Capture One Pro and Photoshop CS5.